Elation Professional is pleased to offer three new lighting control products designed to ease communication, optimize functionality and increase compatibility of intelligent lighting systems. 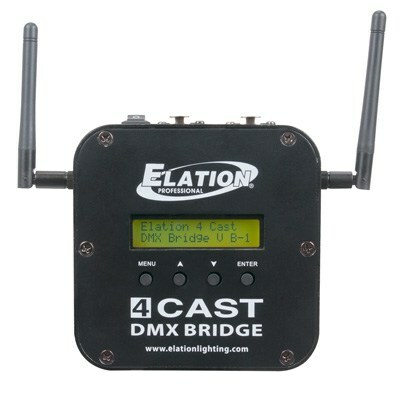 The 4CAST DMX BRIDGE™ is a compact 4-universe wireless device which seamlessly bridges WiFi, Art-Net, sACN, and E-FLY™ (Elation’s wireless DMX solution) signals to wirelessly control compatible DMX devices, an ideal solution for small production events, nightclubs, bars or any event or venue which requires hidden data cables. The 4CAST DMX BRIDGE creates a private standalone 2.4 GHz DSSS (Direct Sequence Spread Spectrum) WiFi network, which coexists in busy RF environments alongside other wireless technologies. No existing network infrastructure is required, or it can connect to an external network. The device sends constant and reliable wireless DMX signals to compatible DMX devices via DMX-512, Art-Net, sACN, or E-FLY. Using the 4CAST iOS app installed on an iOS compatible device provides additional easy control of compatible DMX devices. 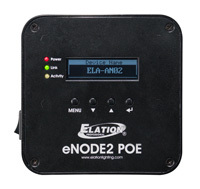 The eNode2 POE™ is a compact 2-universe Ethernet-DMX node powered over Ethernet (POE) that supports Art-Net compatible DMX control systems utilizing a single RJ45 auto-switching 10/100Mbps Neutrik etherCON input and two multi-configuration 5pin Neutrik DMX data outputs. Features include DMX bilateral conversion support, a 4-button control panel, an OLED system menu display and 3 LED status indicators. Compact and made of lightweight die-cast aluminum, it includes a mini omega bracket for easy clamp/truss mounting. No external power supply or cord is needed. The IPC415 is an intelligent DMX power control center featuring 4x powerCON outputs (15A max each), 4x 5pin XLR DMX outputs, 1x 5pin XLR DMX input, and 1x 5pin XLR DMX thru-put. Power to the powerCON outputs can be scheduled to automatically switch ON/OFF via an internal scheduler when the DMX signal is lost or when a specific cue is triggered from a DMX console. The IPC415 can be mounted in a standard 19-inch rack space using the included rack ears, or truss mounted using a clamp (not included) attached to the M10 rigging point in the center of the unit. It includes a multi-voltage universal auto switching power supply (100-240v) for use anywhere in the world.